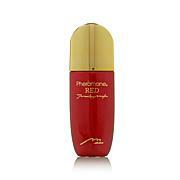 Marilyn Miglin Pheromone Musk Body Cream 8 oz. This trio includes an eau de parfum, a bath and shower gel and a body creme, all scented with Marilyn's delightful Pheromone Red fragrance. Pheromone Red is the essence of intoxicating femininity — a fragrance for the ultimate seductress! Ingredients: Water, Mineral Oil, Prunus Amygdalus Dulcis (Sweet Almond) Oil, Sesamum Indicum (Sesame) Seed Oil, Petrolatum, Glyceryl Stearate, Cetyl Alcohol, Lecithin, Triethanolamine, Sodium Laureth Sulfate, Lanolin Alcohol, Fragrance, Propylene Glycol, Carbomer, Methylparaben, Propylparaben, Retinyl Palmitate, Prunus Persica (Peach) Fruit Extract, Prunus Armeniaca (Apricot) Kernal Oil, Imidazolidinyl Urea. May Contain: Yellow 5, Yellow 6. Ingredients: Alcohol 40-B, Perfume Oil, Distilled Water. Ingredients: Water, Sodium Laureth Sulfate, Cocamidopropyl Betaine, Sodium Chloride, Fragrance, DMDM Hydantoin, Symphytum Officinale (Comfrey) Extract, Chamomilla Recuttia (Matricaria) Flower Oil Extract, Arnica Montana Flower Extract. May contain: Blue 1, Yellow 5, Yellow 6, Red 40, Red 33. I love this fragrance set! It's so unique and different and an absolute great value. Everyone has an interesting look on their face when I wear this fragrance! Thanks Marilyn! Beautiful I always get compliments! Product is long-lasting, great scent and it does attract positive reactions. My husband loves it. Lose yourself in luxury with Elizabeth Arden. A delightful, fragrant blend of white tea, madras wood and musk, this shower gel cleanses and refreshes your skin. Escape to a world of elevated simplicity, and let the musky, woodsy scent of White Tea softly spirit you away. What You Get 13.5 fl.